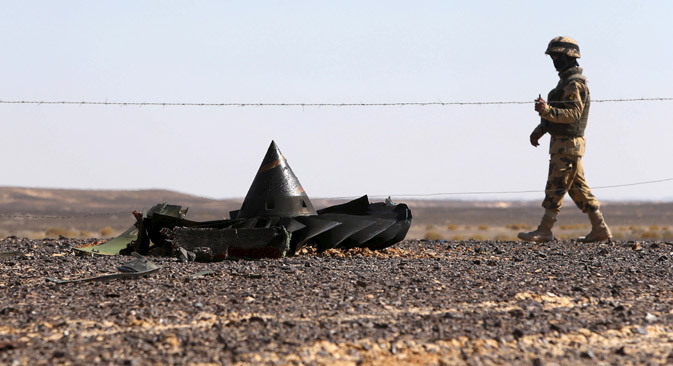 An Egyptian army soldier stands guard near debris from a Russian airliner which crashed at the Hassana area in Arish city, north Egypt, Nov. 1, 2015. RBTH presents a selection of views from leading Russian media on international events, featuring updates on the crash investigation of a Russian passenger plane in Egypt, the release of a new message by leaders of Al-Qaeda and how supply problems complicate Russian space program’s operations. Why did the A321 airliner descend into a tailspin? By the morning of November 2, experts had formulated three main theories as to why Kogalymavia airline's Airbus A321 plane crashed in Egypt on Saturday, the Svobodnaya Pressa online publication reports. The first version posits that a fatigue crack in one of the elements of the fuselage was responsible. As it turns out, the Airbus A321 hit the runway with its tail while landing at the airport in Cairo in November 2001. Another theory blames a faulty engine for the crash. The third version postulates that a terrorist attack was responsible. The publication interviewed several civil aviation experts to analyze the currently known evidence. "I find a lot of strange things in the actions of the pilots," says Oleg Smirnov, president of the Civil Aviation Air Transport Infrastructure Development Fund. "Why did the A321 plane climb sharply in the beginning without coordination with the ground? No commander can change the altitude without coordination with ground controllers. Then the crew sharply dropped altitude, climbed again – and turned the plane into the so-called second mode, when the liner lost lift and fell into a tailspin. Why did it happen is the main question for me as a professional." "The decoding of the 'black boxes' should show why speed dropped,” Smirnov continued. “It may drop for obvious reasons, first of all, due to engine failure or the failure of both engines, or the speed may drop sharply in the case of a strong decompression of the aircraft. " "The catastrophe could be caused by three factors – the incorrect actions of the crew, a technical failure or external interference," says Magomed Tolboyev, a decorated pilot and the honorary president of the MAKS International Aviation and Space Salon air show. "I have come to the conclusion that there was a small explosion in the inspection hatch, where the liner's hydraulic system adjoins its computer control system,” says Tolboyev. “Any inspection hatch is a vulnerability in the plane, its Achilles heel." Al-Qaeda leader Ayman al-Zawahiri has released a recording on the internet calling on warring terrorist groups to set aside their differences and unite against Russia, Shiites, Alawites and the Western states, the business daily Kommersant reports. The recording of his speech surfaced on the internet on November 1, but it was not clear when it was made. Grigory Kosach, a professor at the Modern East Department of History, Political Science and Law at the Russian State University for the Humanities suggests that the mitigation of al-Qaeda's position towards the Islamic State was not in the least caused by Russia's actions. "The Russian operation in Syria led to the emergence of such statements,” Kosach says. “However, it is necessary to understand that Russian air strikes are often not accompanied by actions of the Syrian army on the ground. It does not consolidate the results of air strikes." Kosach also noted that the Russian intervention in Syria has elicited sharp reaction from a number of Muslim organizations. "Remember the statement by 31 Saudi theologians, the position of the International Union of Muslim Scholars,” says Kosach. “They have called for decisive action against Russia." The launch of the space system has been postponed due to the U.S. ban on the supply of components for Russian satellites, the Izvestiya daily newspaper reports. "We have shifted the terms of Arktika, as we had to redesign part of the equipment due to the sanctions," reports Sergei Lemeshevsky, the general director of NPO Lavochkin aerospace company, which won the contract to build the system in 2012. The Arktika multi-purpose space system was created to provide communications and monitoring in the polar regions and waters of the Arctic Ocean. The contract was due to be completed on November 25, 2015. But then the draft Federal Space Program for 2016-2025 set a new launch date for the first Arktika unit for 2017. More than half of Arktika’s spacecraft, as well as other Russian satellites, were initially to be composed of imported components.